Water heating is often the second largest energy expense in a home, and can account for up to 20% of the utility bill. By making a few simple changes you can cut your hot water use and lower your monthly bill. Download this information in Adobe PDF format. Take more showers than baths: Bathing uses the most hot water in the average household. 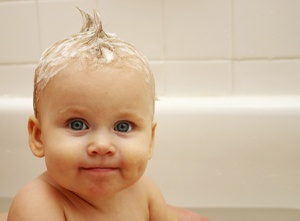 You could use 12-25 gallons of hot water for a bath, but less than 10 gallons during a five-minute shower. Use cold water when you can: Use cold water instead of hot to wash laundry. Today’s detergents work well in cold water. Use your dishwasher: If you only run full loads, dishwashers use less water than washing dishes by hand. Scrape food from dishes before loading, but let the dishwasher do all the washing. Wash dishes with less water: If you wash dishes by hand, fill a big bowl with warm soapy water for washing and give them a quick rinse. Don’t just let the water run. Twist the tap: Turn the water off while you’re brushing your teeth, lathering your hands with soap, shaving, and scrubbing dishes. Install a faucet aerator and low-flow showerhead: These reduce water use and energy waste. If you’re gone, turn it off: If you’ll be away from home for a week or more, turn off your water heater at the breaker. When you return home, turn it back on and your water will be hot again within a couple of hours. Fixing leaks and installing low-flow faucets and showerheads are quick ways to reduce hot water use. Choose low-flow showerheads: Bathing uses a lot of hot water. To cut energy waste, choose short showers instead of baths. If your showerhead is more than 20 years old, or if the flow restrictor has been removed from a newer model, it’s time to get a replacement. Install Faucet Aerators: Aerators screw onto the tip of the faucet. They are inexpensive to replace and installing a low-flow aerator can really help conserve water.